Manila. 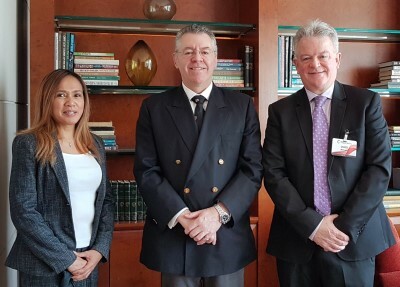 David Stringer-Lamarre, MD of Fortis Consulting London and Chairman of the Institute of Directors, London Region, was very pleased to meet with Chris Nelson, Chairman of the British Chamber of Commerce in the Philippines. David and Chris exchanged information about the present business situation in the UK and the Philippines and explored potential future opportunities for companies based in the UK, the Philippines or the wider ASEAN region to work together. Image, left to right: Attorney Aimee Alado, David Stringer-Lamarre & Chris Nelson.